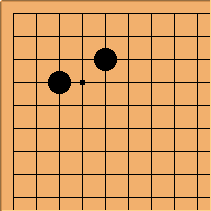 There are perhaps nine normal corner enclosures in go. The number of unorthodox ones that are sometimes seen is large (as many as 50), depending on quite what one allows. See enclosure for initial discussion. For projects like the unusual enclosures page, one cannot rely on popular names for enclosures. Those can of course be used as alias names for pages here. Suppose we interpret ABCD enclosure to mean the enclosure built from the A-B and C-D points in a corner. This then has been the most orthodox enclosure for komi go. It is built from a 3-4 point and a 5-3 point, as we look at it. Hence the name 3453, faute de mieux. That means that 3453 enclosure is another name for the kogeima shimari, also known as the small knight's move enclosure. A negative opinion is at stop the notation madness. Correct Japanese would have this as kogeima-jimari, in fact; this phonetic change applies to the other enclosures too, but is less likely to be met in English-language texts. The variety of names encountered is one reason to standardise on a notation. See also enclosure nomenclature.